Any ways this palette is not actuly avalable to buy yet I dont think as it was a special release at imats. I think this palette will be out soon though... 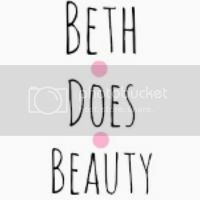 I wish I had picked up lots more from the charles fox stand at imats but I didnt so if anyone has recomends that I need let me know and around christmas I will pick them up from PAM. 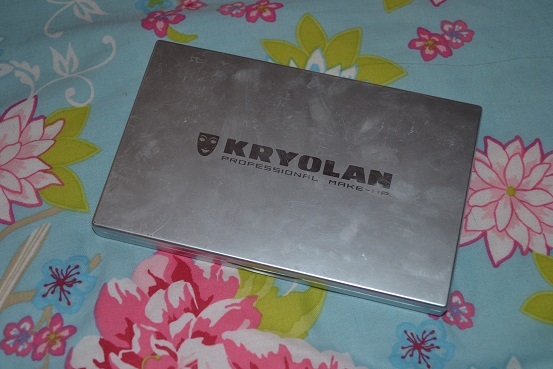 Kryolan dont focise on packaging, of corse they make the packaging useful and so it protects the products but kryolan dont spend a bunch of time comming up with pretty packaging they like to stic to the mettal tipe packaging with there logo on the top. Basic packaging I dont care all I care about is the product in side and that is exactly what kryolan care about. 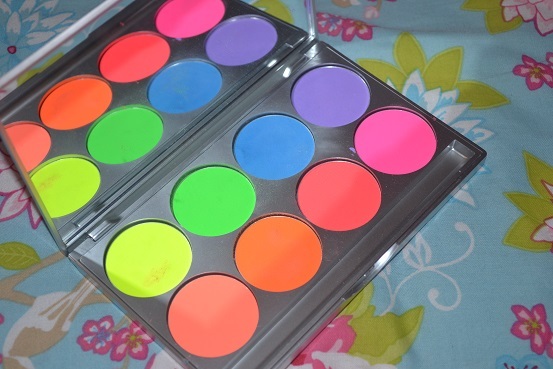 This palette is a uv palette so if you have a uv light these will activate but sadely I dont have a uv light but im hoping to do a uv shoot in the futucher so keep an eye out for that. anyways the colours in this palette are supper bright and very pigmented, you must use a primer under them though as there very powdery. well a few thoughts on one of the colours in normal light... in normal light the UV red is actully pink which is quite strange but its a defferent pink to UV pink. so this is the palette swatched without any primer but the colours are alot more bright with a primer under and of corce in a UV light. Kroyolan focases on the product quality and not the packaging, the uv colours are very pigmented and bright, there a very good size of pan. this palette also has an amazing mirror. Kryolan products are hard to find in shops, not as bad as some brands but is hard to get if your not in london. also these eyeshadows have a kind of strange smell to it. now im actully going to mone a little about the packaging, i dont actully care but this might be something that would anoy someone is that the packaging dose scratch supper easly. This products is not actully avalable in the UK yet to buy but when it is I think it will retail for around £50 I did buy this palette at IMATS for £40. You can buy kryolan from PAM, Charlse FOX and guru makeup. Whoa! 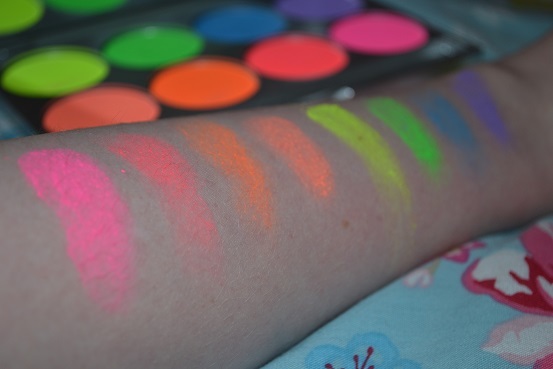 Such a gorgeous neon palette!